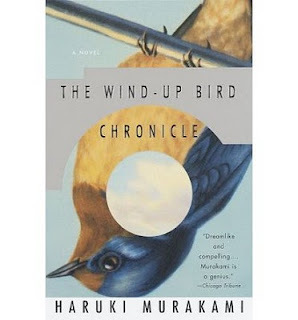 I'm very excited to have the chance to join Tanabata in a three-month long read-along of The Wind-Up Bird Chronicle by Haruki Murakami. Simon suggested I try Kafka on the Shore first but I ran out of time so this ended up being my first Murakami novel. I've been interested in it since last year when my husband ran a Facebook application that gathered data from his friends and said that the most frequently listed "favorite" book in his friends group was this one! Anyway, the group read started with Book One for this month and I finished it just in time. Told in the first person, we follow Toru Okada, a married man in a Tokyo suburb who has quit his job and is trying to figure out what he wants to do next with his life. He certainly doesn't want to return to his career in law but he's not sure what else lies in his future. While he's spending his time at home, his wife gone at work, many things happen to him that are out of the ordinary. He receives strange phone calls from an overly familiarly woman. His cat goes missing and his wife brings in a psychic to help them find it. He meets a sixteen-year old neighbor girl who ditches school and does surveys around the city of bald men for a wig-making company. And this is just the start of many irregular things that happen. He tries to make sense of all of this but his calm personality also allows things to happen around him and, instead of acting out, he tries to find the reason that these things are coming to him. I'm really enjoying this book so far. There are some parts that are a bit over the top but I get the sense that Murakami doesn't write without purpose. I think that many things will be explained and tied together before the end of the story. As a main character, Toru Okada is very neutral--he doesn't really initiate anything--and yet he is somehow also quite likable. Apparently the reader isn't the only one to think this. Many of his fellow characters find him easy to confide in and seem to trust him immediately. I am very interested to find out what happens in the rest of the story and it will be hard to wait to find out! Thank you for reading along and posting your thoughts on Book One, and I'm sorry I'm so late in commenting both here and on the discussion post. I'm glad you're enjoying your very first Murakami novel. I do have to warn you that many more irregular things will no doubt happen, and Murakami is known for not tying things up all neat and tidy. With Murakami, at least for me, it's about the journey, not the destination, if that makes sense. Even though this is a re-read for me, I'm really looking forward to continuing on to Book Two as well.